Posts have appeared on several rumor sites describing Apple’s expected hardware announcements at the World Wide Developer Conference next week. All the models will presumably sport USB3 ports, allowing us to use inexpensive USB3 drives at full speed. 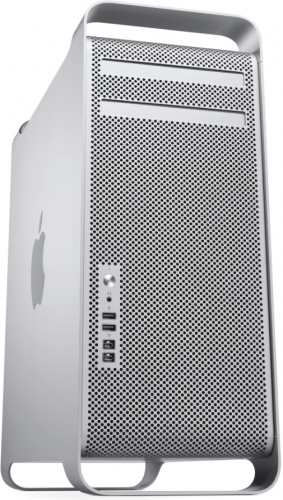 And a new Mac Pro will apparently be part of the lineup. This is welcome news for those of us who prefer to do our editing on Mac-based systems. Despite Tim Cook’s belief that we are now living in a post-PC world, if Apple had let the Mac Pro line lapse permanently, the professional content creation world would have probably begun a slow and inexorable march to Windows. New Macbook Pros are said to be thinner and lighter, with Intel’s Ivy Bridge chipsets, retina displays, no optical drives, and perhaps missing Ethernet and Firewire ports (yes, you read that right). We may also see some models with NVidia GPUs, which could improve real-time performance for editing and effects applications. This entry was posted on June 6, 2012 at 8:24 am and is filed under Apple, Avid. You can subscribe via RSS 2.0 feed to this post's comments. You can comment below, or link to this permanent URL from your own site. The world’s sexiest tower is expected to continue to serve professionals and researchers everywhere. But we’ll know for certain on June 13th. It may be a different form factor. It should certanly sport a Thunderbolt port or two as well.